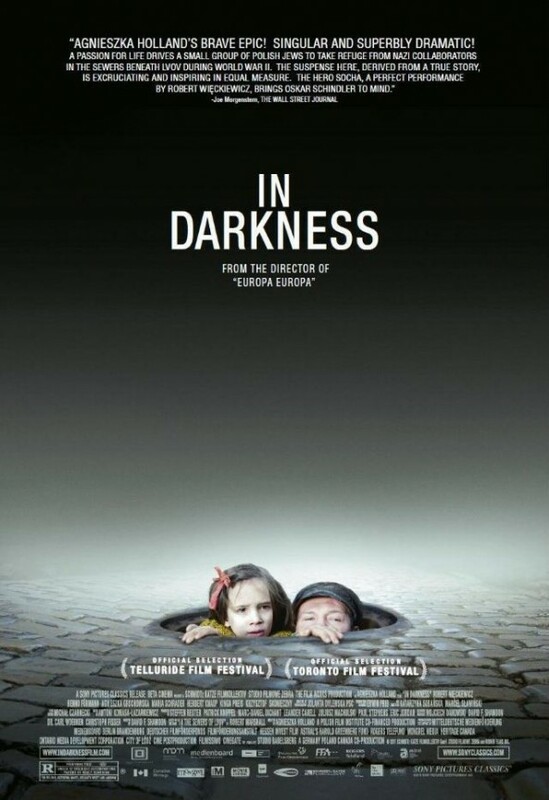 Agnieszka Holland’s movie In Darkness is a Polish/German/Canandian co-production based on a true story. Leopold Socha (Robert Wieckiewicz) is a sewer worker and petty thief, living in Lvov, a Nazi occupied city in Poland. One day he meets a group of Jews trying to escape the liquidation of the ghetto. After lengthy discussions he agrees to help them hide in the labyrinthine sewers under the city. Many of the Jews do not trust him, knowing well that the Nazis’ pay money for every Jew and that many Poles don’t like Jews either. Socha is rather poor and he and his family are struggling. Helping is not an act of altruism but a great opportunity to make money, as one of the Jews is very rich. While Socha does a great job at providing them with food and helping them to change hiding places, when one gets too dangerous, he has not feelings or compassion for them at first. But over the months – the small group has to stay in hiding for 14 months – he gets to know them and admires their courage and determination. At the end, although they have run out of money, he still helps them, and risks his life and the lives of his wife and daughter. In Darkness is a very moving film, based on an amazing story of resilience and courage. Staying in the dark and the stink, surrounded by rats, in close quarters, is very hard to imagine. Not all of those who are in the sewers in the beginning make it until the end. Quite a few, escape, some prefer to be sent to a camp. When everything goes fine, the situation is bearable but hunger, illness, boredom and one woman’s pregnancy turn it into a nightmare at times. On my DVD is a documentary called In Light, in which the film director Agnieszka Holland and Krystyna Chiger, one of the children who spent 14 months in the sewer, talk together about the film. When Agnieszka Holland started filming, they had no idea that here still was a survivor although Krystyna Chiger had published her memoir The Girl in the Green Sweater shortly before that. A streak of luck brought them together. It was great to hear Krystyna’s impressions of the film. According to her, the movie manages to show exactly how it was. Everything, down to the smallest detail is correct. Leopold Socha was one of many Poles who risked everything to hide Jews. It’s important to tell these stories as well. There were quite a few well-known German actors among the cast – Benno Fürmann, Maria Schrader and Herbert Knaup – who were all good, but none of them surpassed Robert Wieckiewicz in the role of Leopold Socha. In Darkness is an excellent movie based on a true story that had to be told. Highly recommended. It’s been a while since the last We Are Looking For a Movie post. I had some requests via e-mail and was lucky to be able to say which movie it was but in this case I draw a blank. Years ago I watched a movie about a young Jewish boy whose mother (who had married a Jew against her father’s will) brought him to live with his grandfather to save him. She did not stay, herself. The grandfather was either Italian or French. I think it was a foreign film with subtitles. The emerging relationship was so touching. One significant scene I hope will help in identifying the movie is when the grandfather admonished the boy never to let anyone see him naked because of his circumcision. I would love to view this movie again, but I don’t know the title. It has to be fairly old. Can anyone there help me to identify this movie? 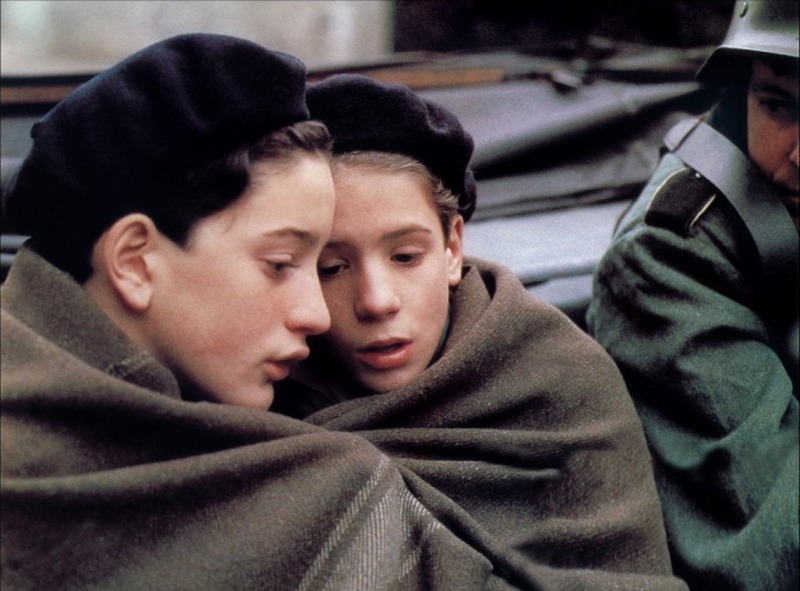 The picture above is taken from Au revoir les enfants. While that is an excellent film, it is not the film we are looking for. 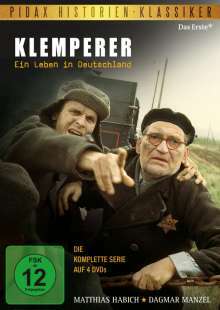 When Klemperer was first aired on German TV, I watched the first episodes but because I was moving I had to stop after the fourth. I always meant to re-watch the beginning and finally finish the whole series which consists of 12 episodes. I had really liked the beginning at the time and now that I have finally re-watched those first four episodes I’m glad I still like it, maybe even more and I’m keen on watching the rest. However it’s very depressing. I didn’t remember it to be this upsetting but maybe it’s just me and I’m in a funny mood. The series is based on Viktor Klemperer’s war diaries, 8 volumes of several thousand pages (here in English Viktor Klemperer’s diaries and in German here). The diaries are a fascinating document. I’ve read the first and it’s breathtaking. Klemperer was a professor of French literature, highly intelligent and with an amazing knowledge which all goes into the diary. He was also Jewish. The amazing thing in the series and the diary is the fact that it shows a man who is incapable of seeing what is going on and that we witness an amazingly intelligent person’s blindness. I find it must have taken a lot of guts to publish this diary because while it is very human it is still such an incredible flaw to be this blind. To watch the series is eerie. It starts in 1933, just after Hitler was elected. At first there are just a few warning signals. Klemperer isn’t allowed to test non-Jewish students anymore, later he will not be able to publish anymore, they will remove him from certain classes and finally he will be fired. While many of his friends leave Germany very early, he doesn’t want to leave, he always thinks that maybe he will be exempt from the next measures only to find out that he wasn’t. His wife is not Jewish and since he himself isn’t religious, he always thinks they will make an exception for him. They even start to build a house. 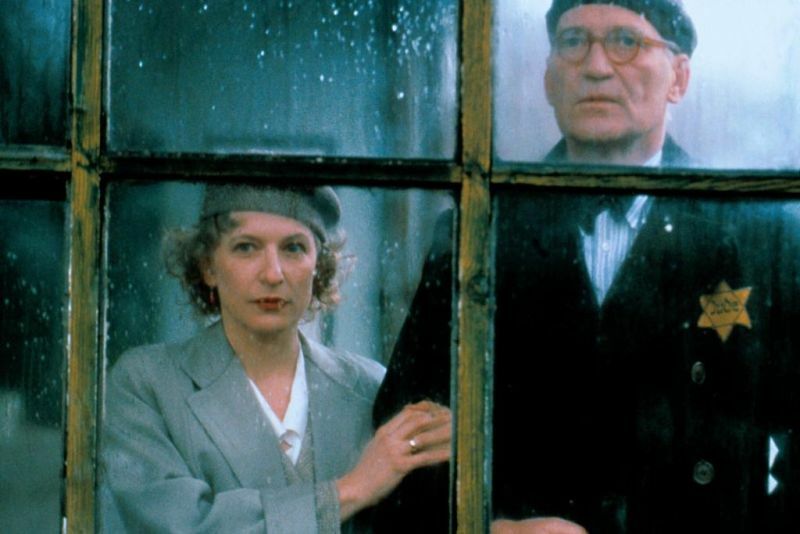 Klemperer’s wife is an amazing character as well as she is so flawed and naive. She still moans about not being able to go on holidays when he has already been fired because he is Jewish. As I already mentioned, the series is quite long. There are 12 parts of 45 minutes each, which means they have taken a lot of time to show the whole story and include a lot of details. I already know that the Klemperers will end up being sent to a camp but survive. Because it spans such a long time, 1933 – 1945, it really feels at times like having been there, having experienced some of it. It is one of the best TV series I’ve ever seen. It has been very carefully executed and with Matthias Habich and Dagmar Wenzel, they have chosen two of the best German actors. Habich is one of my favourites, and one of the rare I like almost as much as Bruno Ganz. A far as I know, there is no version with English subtitles available which is a pity. At least the diary is available in English too. I’m in two minds about István Szabó’s epic movie Sunshine. It tells the story of a family of Hungarian Jews, the Sonnenscheins (which means Sunshine in German), from the end of the 19th century until the end of the 20th. While I think it told me a lot about Hungary and the treatment of Jews in Hungary, I was far less thrilled about the length (3hrs) and the choice to have the three main characters, grandfather, father and son played by the very same actor, namely Ralph Fiennes. I would have found this artificial with any actor but given my dislike of Fiennes, it added annoyance. If you do not mind seeing the same actor in three different roles and are fond of Ralph Fiennes, you will probably like this movie a lot. I do not understand why Szabó chose to do it like this, why couldn’t there be three actors? I remember the Archers chose the same approach in The Life and Death of Colonel Blimp in which Deborah Kerr plays three different women but that worked much better. The Sonnescheins are a modest family but then the patriarch invents a recipe for a tonic which makes them incredibly rich. As a direct result of their social ascendance, the two sons, Gustav and Ignaz, both study and become doctors, of medicine and law respectively. While Ignaz is loyal to the Emperor, Gustav feels more and more alienated by monarchy and becomes a communist. WWI changes not only Hungary but Europe as a whole. The biggest change in the lives of the Sonnenscheins’s however is that they choose to change their name from Sonnenschein to the more Hungarian sounding Sors. Long before WWII breaks out, the Jews are seen as a nuisance and it is very hard for them to integrate. Ignaz’s and Valerie’s son Adam becomes the Hungarian fencing champion and wins at the Olympics in 1936. After having changed their name, the Sors also change their religion and the family converts to Catholicism. Still, this doesn’t help them, when WWII breaks out, the family first lives in the ghetto, some are killed, some escape and Adam and his son Ivan are sent to a concentration camp where Adam is tortured and killed. His son will never forgive himself that he just stood there and did nothing. After the war he joins the communist party. Anti-Zionist sentiments are spreading. The government changes often and depending on who is in charge, other groups are persecuted but what they all seem to have in common is that anti-Semitism reigns again. When the end of the communist state has finally come, Ivan realizes that the only way to be really free, is to be true to yourself. He decides to change his name back to Sonnenschein and to be proud of his heritage, no matter what government and changes the future will bring. While I wasn’t blown away by the movie and would have preferred if the main character had been played by three different actors instead of one, the movie isn’t bad at all. It had a lot of thought-provoking elements. There is the incident in the concentration camp in which three guards control 2000 prisoners. Ivan’s uncle later tells him that it is unforgivable that they didn’t do anything. This is a reproach one hears occasionally. People don’t understand why 2000 wouldn’t fight against 3 or 10 even if those were armed. The movie implies an answer which is interesting. It is obvious that if they had fought back the guards, some of the Jews would have been killed. The majority would have been saved but that would have needed the sacrifice of a few others. Another interesting element is the fact that Hungarians sent Jews to the camps and not Germans. There were a lot of collaborators among the Hungarians. The movie underlines that the Hungarian society, whether it was during the monarchy or later under communism, was to a large part anti-semitic. What I really liked is that the movie focusses on one family only and like that manages to give a much better feeling of the incredible changes which took place. To enhance authenticity Szabó included some original footage which in some cases was quite chilling. When Adam takes part in the Olympics of 1936, Szabó included original footage of the opening in which we see Hitler. Because it’s a very long movie, it’s a very complex movie and I know I didn’t do it justice. There are for example some very troubled love stories which I didn’t mention in my summary but which are quite important. I liked the story between Valerie (Jennifer Ehle) and Ignaz but didn’t care for the love triangle including Adam, Hannah (Molly Parker) and Greta (Rachel Weisz). 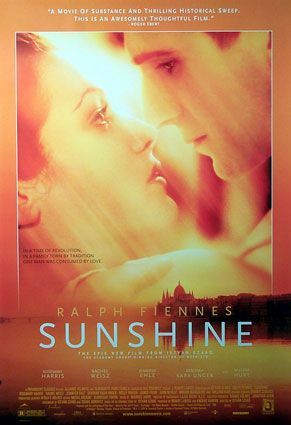 I would recommend Sunshine if you like epic films and have an interest in the history of Hungary and the Holocaust from another perspective. The French/German/Hungarian co-production, The Round Up – La Rafle, is a powerful and intense movie based on true facts. In the nights of July 16 and 17 13000 Parisian Jews were arrested in a raid in Paris and confined in the Vel d’Hiv (Winter Velodrome) or Drancy internment camp and from there to the extermination camps in Poland. Of the 13000 arrested Jews only 25 survived. Many among them, at least 4000, were children. Not one of them survived. The aim was to round-up 25000 Jews but 10000 escaped and were hidden by the people of Paris. The most shameful part was played by the police who actively contributed to make this happen. French President Jacques Chirac apologized in 1995 for the complicit role that French policemen and civil servants served in the raid. The movie begins with original black and white footage. We hear Edith Piaf sing “Paris” while we follow Hitler on his tour through the city. That sent shivers down my spine. To think that if the Germans had won the war, Hitler would have made Paris his capital. In the pictures he looked like a guy inspecting real estate, deciding on what walls to knock down, what to keep. Horrifying. Here is an account of Hitler’s tour, written by his pet architect Speer. After the opening we see people in a Parisian street located in Montmartre. The street scenes show that French and foreign Jews amicably lived together with non-Jewish Parisians. Many French people are friendly towards the Jewish population, but others are openly hostile and hate them. The movie focusses at first on a few Jewish families. It shows how secure they felt. They didn’t think the French government would ever give in. But it did. In exchange for privileges it promised to round-up the Jews and deport them eventually. After the round-up we see the scenes in the Vel d’Hiv and the point of view changes. A young French nurse, Annette Monnod (Mélanie Laurent), has been sent to help alongside a Jewish doctor (Jean Reno). The doctor and a handful of French nurses are the only health care professionals for 13000 people. There is almost no food, no water, no toilets and the hygiene is abominable. Many of the children are ill. There are doctors willing to come and help but they are not let in. Operation Spring Breeze, as this round-up is called, should be kept a secret. While there are many collaborators among the French, there are many more who are hostile towards the Nazis and willing to risk their lives to save Jews. Annette becomes very attached to the children and does everything to help them survive. She follows them to camp Beaune where they stay until they are finally deported to Auschwitz. Until the last day many think, they are sent to Poland to work. Rumours that those camps are extermination camps are only spreading very slowly. I really loved this movie. It moved me, I found it very touching and emotional. I would say that of all the Holocaust movies I’ve seen, this is my favourite. I liked that it focussed on a few Jewish families with different backgrounds. Some rich French Jews, others immigrants and people who fled from other countries. Those individual stories are more interesting and touching than the story of a mass of deported people. In chosing Annette, a French nurse, we see how far the “good” Parisian people went, risking life and health for others. It’s such a shameful chapter in the history of France, its important to remember that there were courageous people as well. The only thing I didn’t like so much was the end. It should have been different but I cannot tell you why or I would spoil the movie. Considering how excellent the rest is, this is a minor fault. I added The Round-Up to my Children in War Movies List. It’s an excellent example. Other Holocaust movies can be found here: 13 Holocaust Movies You Should See. The central theme of the Austrian movie My Best Enemy – Mein bester Feind is art robbery and expropriation of Jews during WWII. It starts in 1943 with a plane crash. Two SS officers and a Jew are on board of that plane. They must be found. Especially the Jew. We don’t know why but the movie rewinds to the year 1938 and the back story will be told. Vienna, 1938. The rich Jewish gallery owner Jakob Kaufmann just recently arrived with his family in Vienna. They have left Germany, fearing Hitler’s rise may bring difficulties. The Kaufmann’s have only one child, Victor (Moritz Bleibtreu), who grew up together with Rudi (Georg Friedrich), the son of their housekeeper. For the Kaufmann’s Rudi is like a son and the two young men are close friends. At least that’s how Victor sees it. Rudi’s point of view is slightly different. He is bitter and jealous and resents all the good things the Kaufmann’s did for him. Fact is, they are rich and he is poor. Victor will be a rich heir, while he will have to work hard. On top of that Lena, the girl Rudi fancies, is in love with Victor. When the SS give him the opportunity to lead a better life, he takes it and joins them. He doesn’t even care that the price is high. He will have to spy on his former friends and benefactors and find out where one of Michelangelo’s original drawings is hidden. The drawing which has been stolen centuries ago from the Pope, is meant for the Führer Adolf Hitler who wants to offer it to his ally Mussolini. It is easy for Rudi to find out where the painting is as Victor trusts his friend. Not long after he showed him where it is hidden, the villa is stormed, the drawing confiscated and the Kaufmann’s sent to labour camps. If the drawing they have confiscated had been the original, the movie would have ended here but as it is a fake, this is just the beginning. Rudi is threatened and has to try to find the original at any cost. He goes and fetches Victor in the labour camp and together they fly to Berlin. On their way their plane crashes. What follows is more humorous than dramatic and the roles of the parties involved are reversed more than once. Hunter becomes hunted and vice versa. Every time when we think: that’s it, this is the end, something happens and the hunt and qui pro quo starts again. I didn’t know anything about this movie but I like Moritz Bleibtreu and Marthe Keller (she plays Victor’s mother) and I knew the producers of The Counterfeiters have produced this movie too. I expected something more tragic so was slightly puzzled at first. This isn’t a drama, it’s much more a comedy. While it isn’t hilarious, it is amusing and I enjoyed watching it, especially the end. This is surprising as from a purely psychological point of view it isn’t very believable. Rudi’s change from friend to foe is more than abrupt. And as much as I like Bleibtreu, he is rather on the chubby side and most certainly doesn’t look like someone who spent years in a labour camp. I’m not sure how Jewish people feel about a movie like this. Is it OK for them to see their trials and tribulations – in this case expropriation and art robbery by the Nazis – told in form of a comedy? I cannot answer this question. There were a few moments at the beginning of the movie when I felt uneasy but on the other hand, using this lighthearted tone, the movie gets our full attention and it is still explicit about the horrible things that happened. I have a hard time to put into words why I liked My Best Enemy but I really did. It’s well done, glossy, entertaining, with a nice pace and a really appealing energy. If they had told this story like all the other similar movies it would have been just one more Holocaust movie. Like this it’s a movie that will stay in your mind.